Former Senegal international defender Omar Daf has been appointed as head coach of struggling French second tier club Sochaux. Daf, who played 14 seasons for Sochaux across two spells, previously managed the club in an interim capacity in 2013 and 2015. Sochaux confirmed he had been given the role following the departure of José Manuel Aira. Daf, 41, was set to take full charge of training at Sochaux on Monday. He had previously worked as an assistant to former managers Olivier Echouafni and Albert Cartier. Omar Daf made 87 appearances for Senegal, helping his country reach the World Cup quarterfinals in 2002. Sochaux have struggled this season, winning just four of their 15 Ligue 2 games and are currently down in 18th place on the 20-team table. Daf, who also played for Belgian side Westerlo and French club Brest during his club career, earned 87 caps for Senegal. 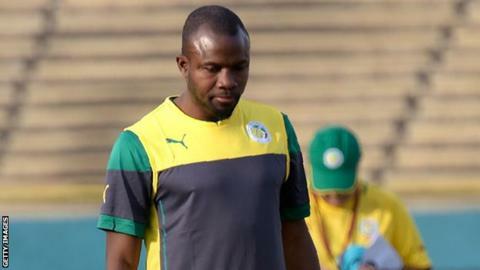 He helped his country to a shock quarterfinals finish at their maiden World Cup appearance in 2002 and worked as assistant to Aliou Cisse at this summer’s tournament in Russia. Before taking on the role of head coach with Sochaux, Daf who earned his Professional Football Coach’s Certificate (BEPF) last year, had been in charge of the Sochaux reserves since the summer of 2017. As a right-back he played for the Teranga Lions in five Africa Cup of Nations tournaments in 2000, 2002, 2004, 2006 and 2012.